Performers include: Denis Leary, Mike Lombardi, Steven Pasquale, Andrea Roth, Daniel Sunjata, John Scurti, Callie Thorne, Jack McGee, James McCaffrey, Natalie Distler, Robert John Burke, Dean Winters, Tatum O’Neal, Lenny Clarke, Charles Durning, Trevor Heins, Olivia Crocicchia, Diane Farr, Adam Ferrara, Sherri Saum, Peggy Scott, Jerry Adler, Larenz Tate, Michael Zegen, Michael Mulheren, Cornell Womack, Ed Sullivan, Cailin Stollar, Gina Gershon, Karina Lombard, Milena Govich, Anthony Mangano, Bernardo De Paula, Artie Lange, Jay Potter, and Neal Jones. The lasting effects of 9/11 on the New York City firefighters and their families is the backdrop for this drama. Tommy Gavin (Denis Leary) has many things to deal with, from the loss of so many of his friends, to being recently separated from his wife and kids, to his personal demons as a destructive, relapsed alcoholic. He’s haunted by visions of his cousin and best friend, Jimmy Keefe (James McCaffrey), who died on 9/11. Tommy begins to realize how much he’s messed up with his wife, Janet (Andrea Roth), and their kids and doesn’t want to lose them. He moves in across the street, to keep an eye on them and be closer. His children are rebellious Colleen (Natalie Distler), son Connor (Trevor Heins), youngest daughter Katy (Olivia Crocicchia). Tommy and Janet continue to be on-again/off-again, and on the off-again times, he dates Valerie (Gina Gershon). Things don’t seem much better at the firehouse. Battalion Chief Jerry Reilly (Jack McGee) struggles to deal with his wife’s Alzheimer’s, a gambling addiction, and his gay son. He’s replaced by the more soft-spoken “Needles” Nelson (Adam Ferrara). 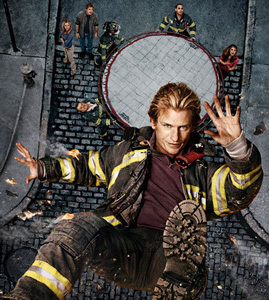 Members of the crew include young and dim-witted Sean Leslie Garrity (Steven Paquale), dyslexic rookie Mike Silletti (Michael Lombardi), womanizing single-dad Franco Rivera (Daniel Sunjata), African American Bart “Black Shawn” Johnston (Larenz Tate), and female firefighter Laura Miles (Diane Farr).